Listeners who enjoy free, unlimited access on Spotify might not enjoy it for much longer. According to Digital Music News, the company could soon limit the number of songs non-subscribers can listen to. Spotify will be entering negotiations with the big three major record labels in October - Sony Music Entertainment, Warner Music Group and Universal Music Group - and it's possible that a solid plan will be in place to give premium subscribers more and free users less. Currently, one of the biggest draws for making the upgrade to a premium Spotify account is to avoid the ads. But going premium in the near future could also give users exclusive access to new music, which could put more pressure on its free users, of which Engadget claims are 55 million strong, to pay up. It's also been reported that Spotify's plan could place a strict limit on the number of songs per album that free users can listen to. Record labels and artists would surely love this move, as it would be another way to convince users to switch to premium. However, this risky move could lead to Spotify's user base shifting away, looking for other free and legal means for jamming out. The driving force then is apparently to make "the free users to feel like they're missing something, not just forced to listen to ads," DMN quotes one source as saying. 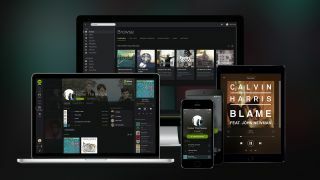 Spotify is reportedly looking to convert more of the 50-odd million Spotify Free listeners to the Premium service. During Spotify's May event in NYC, CEO Daniel Ek, took the stage to talk about how video, as strange a venture as it is for the music streaming service, will makes it way to users. Spotify itself though is refusing to dignify this latest report with a response, while Ek also went on record last month stating free music could actually grow the industry by a factor of ten compared with its current size. "If we build the revenue model around 'freemium'," Ek told The Guardian, "the music industry will be much larger than it's ever been before, more artists will be able to make a living by being artists and more people will listen in turn." Ek equates Spotify Free with the radio industry, itself a historically free, ad-supported medium. But with the amount of money the likes of Apple Music and Google have to back their own offerings it's an increasingly competitive arena to be operating in.